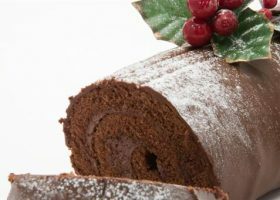 Enjoy a classic French Christmas treat with Paul Hollywood’s delicious recipe for a chocolate sponge yule log. Preheat the oven to 180C/gas 4. Whisk together the egg yolks and caster sugar until smooth and creamy. Beat in the cocoa powder. Whisk the egg whites until stiff and fold into the cocoa mixture. Spread the mixture evenly into a baking parchment-lined Swiss roll tin. Bake for 20 minutes. Remove from the oven, cover with a clean tea-towel and set aside to cool in the tin. Mix together the chestnut puree and brandy and sweeten with sugar to taste. Spread the chestnut mixture evenly over the chocolate sponge. Whip the cream until stiff. Spread the whipped cream evenly over the chestnut mixture. Carefully roll up the chocolate sponge over the filling. Dust with icing sugar and drizzle over the melted chocolate.